Dr. Simmons’ research study has been approved by the Western Institutional Review Board. This is a reflection of the dedication and interest of Dr. Simmons in helping patients, as it takes considerable commitment to receive this type of research approval. This research project evaluates the workflow of an auto-titration mandibular positioner in helping subjects, under the care of a dentist, decide if an oral appliance would be helpful to them in treating their obstructive sleep apnea. An auto-titrating oral appliance moves the mandible in tiny increments during sleep, so as not to disturb the subject. The movements of the mandible are within the normal range of motion of each individual subject. The movements are determined by a computer algorithm and are based upon continuous feedback from the sleep testing equipment worn at the same time and connected to the adjustable mandibular positioner. Information used in the algorithm includes airflow from each nostril, pulse rate, oxygen saturation, breathing effort and other data. 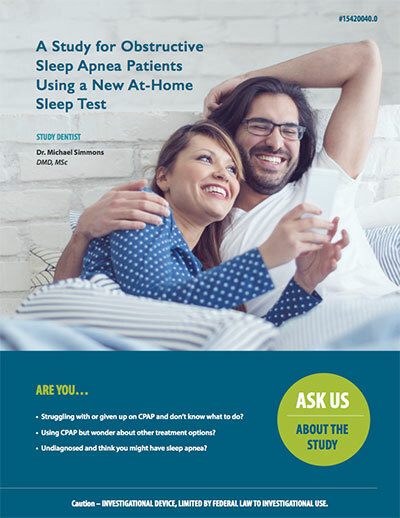 This study helps determine if the subject’s sleep apnea can be managed by an oral appliance. The study also gives information as to the best position for the mandible to enable that subject’s best breathing during sleep. This is landmark information that is difficult to find otherwise. Similar equipment has been used in the past few years in limited sleep laboratory settings controlled by a sleep technician but has not been available as a home device in the U.S. Dr. Simmons office is one of only two current sites in the U.S. approved to use this equipment as part of a study protocol. Please click the image to the right to view more information on Dr. Simmons research.